We are basically lower-middle class. A one income family with 3 kids. From all the talk, one would think we are dirt poor and cannot survive. Yet we do. Pretty comfortably, I might add. Here are a few thought as to why. The only thing we owe on is our house. It’s descent size but not massive. Two kids will share a room until one of the 3 move out. *gasp* And we prefer it that way, shocking I know. We only have a house because my husband (as a single man) purchased a town home way below his means. And we lived in that “semi-inconvenient” town home until we had 2 kids and the profit of a sale would cover a house down payment. We also don’t owe on school loans because we bought nothing but needs for several years. (All extra money went to pay them all off.) Not having those helps tremendously. While we use credit cards for convenience, we never carry a balance. All of our needs are met (first!) Food, clothing, shelter, water, power, transportation, these items are always covered. We recognize this and are extremely grateful that our income covers the basics. Some are not as fortunate. We have such great peace of mind that the basics are covered, we get to really enjoy when there is extra to cover the fun stuff. We value getting a deal. We truly enjoy finding deals and bargains. We love shopping thrift stores. We love store brands. It doesn’t make us feel “less than” because we don’t value the pride attached to brand-name or new. The reverse is actually true. It makes us feel like we are smarter than others wasting money. We get to live our value of people & quality time over stuff. We trade money and a second income (which buys nicer stuff) for what we really want – joy, peace, love, less stress. I trust God will provide for my needs. First and foremost, spiritual needs, but also physical needs. We (similar to my upbringing) have a wonderful community and support system. Should something terrible happen financially – we know our God provided support system would step up. And we do the same for others. Not having much money as a kid, I saw my parents work to cover needs and then some. We were loved and didn’t feel like we missed out. In summary, our world view regarding money is very different than most. The resulting freedom: Absolutely Worth it. ***Long time readers will know this, but I’ve blogged extensively on how we got out of debt. Starting in Jan 2012. We paid off 46K in 22 months. If you want to read about that, look for the “by the number’s” posts. To be fair, we were dual income for most of that time, pre-kids. *The van is fixed. It turned out everything was under warranty. The ‘faulty part’ that landed it in the shop to begin with was probably ‘faulty’ because our van required something a little more hefty. So it’s fixed and running well – and didn’t cost us other than time. *JJ’s work has gone well. It’s been a little slow the last week or so, but God continues to provide us what we need financially and it’s been nice to have him home a little more. We were able to go to the zoo last week and even today, we had a nice afternoon of running errands and then hanging out as just our little family of four. It’s nice to be able to make a few family memories before we enter a hard season. *E is still waking up somewhere between 4-6 am to eat. I’m bummed he’s not sleeping through the night but he is pulling up, saying da-da-da-da, and crawling a bunch. My guess is these developmental milestones have ratcheted up his appetite. *My mom comes in at the end of the week – looking forward to seeing her! *We seem to all have allergies (or head colds) but so far surgery is still on schedule and I’ve been improving. *My dad flew out yesterday after visiting for a week. It was great to have him in town. –> Prayer Request … My dad isn’t able to be here for the surgery because he’s helping one of my brothers’ family. My nephew, Jack, has some medical tests in the midwest next week so my dad is going to be helping drive across country. Please pray for that trip. Safe travels and successful medical tests and procedures. We are hopeful Jack (born at 27 weeks, now almost 4 yrs old) will have some good news about long term status of his esophagus (he currently has a trach). The little guy’s biggest procedure day is also May 25th, same day as my surgery. Thanks for all of your prayers so far. I wanted to update two of the items I listed a few posts ago. Work for JJ: PRAISE! JJ is starting a contract job that will be 40 hrs a week. This is AMAZING! Someone reached out to him with the work and everything fell into place. It is a big change for our little family. Please pray that I have the energy to keep up with the boys in the coming weeks. Also, our oldest will be a little bummed. He’s so used to having daddy “home from upstairs” for lunch. My Mom: PRAISE! She was able to purchase a flight at a pretty good price. Thanks again everyone, for your continued prayers. Said good-bye to a friend of 9.5 years. I knew it was coming, but it’s still an adjustment. My dear Jetta, seen here freshly washed, at my grandparents house in the middle of North Dakota. 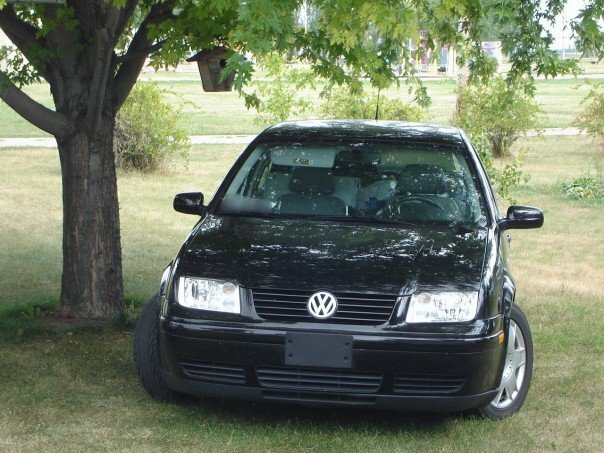 I purchased my Jetta in August of 2004. It was 4 years old and such a huge, grown up moment in my life. In the handful of years of having a license, it was the car I ‘dreamed of’. I saved up my money, had a pretty big down payment (prior to my Dave Ramsey days) and worked hard for the next 2 and a half years to pay it off. I even deferred my move to Chicago for grad school so that I could finish paying and officially become the owner. It played an important role in one particular event concerning the “boy next door” who eventually became a pretty important person in my life (my husband). It has several issues ranging from a CD player’s broken fuse that continued to drain the battery until removed; a self dimming rear-view mirror, that broke and leaked gunk all over; cup holders that had nifty, spring/size adjusting arms that were amazing – until the springs and arms broke (it never held cups sturdy, with out potential sloshing again). There were a few bumps and bruises along the way, from the time I backed crooked out of the driveway and sideswiped my roommate’s car; the time I ran into our garage; the time I locked the keys in and my boss used some wood and a hammer to pry open the door; the time the bumper fell off, hanging within an inch or two off the ground and I didn’t know (I proceeded to drive at highway speeds for 20 miles); the time the belt broke and I lost all power steering in the middle of a busy road. One time, it over heated and – now on my own in Texas – I had to find someone to look at it – figure out toeing and get it fixed. The shop I ended up taking it to – wow… not in a good part of town. The tow truck got lost trying to take it there. Going to pick it up, one of my girlfriends from work drove me down and I’m pretty sure when I got out to go pay and pick it up – she was getting nervous that I might have been abducted or killed. 🙂 Rough part of town – but at least it was the middle of the day! And they gave me a great deal and did a terrific job fixing it. Anyway – it was an adventure filled nine and a half years. We all move on in life. Even with all of the issues, we were still able to trade it in for a decent 1,500 dollars toward our new “I’m officially an old grownup” minivan. Got to stay practical right? Good bye friend. I’m so glad we had almost 10 years together and I have two sets of plates (WA & TX) that I will hold on to – and remember you by. To start with – no new progress was made on debt this month. We are still putting the debt snowball on hold due to lower than expected income. We are adding to our “crisis fund” which we hope will we will convert into debt pay-off one day. One specific number I thought I could highlight from this month was our Vacation Fund. We planned since May to go to Washington State to have Christmas with my family. Every month, we put aside money for the vacation. From this fund, we paid for our plane tickets, our rental car, and all of our on trip expenses and purchases. We still worked to be frugal on the trip, not spending excessive amounts. We are pleased to report we were at least $600 UNDER budget. SWEET! Because you know what that means… the extra $600 goes into the Crisis Fund. Since I don’ t have any other numbers to report, I thought I’d do a quick summary of 2012 by the numbers. This year, we sold items on CraigsList, re-purposed gift cards, and turned coins into the bank in order to drum up some extra income. We also had several items come up that we had to figure out how to cash-flow. We cash-flowed enough money to cover a Garage Reno, an MRI, a Washer, a mattress set, and the closing costs on our home refinance. And of course, squeezed every cent we could find out of the budget for extra debt payments. I look at those numbers and I think wow. You mean… we put enough toward debt to pay for a new car? I find it SO encouraging. No, we don’t have that money to use now – but yes, we are avoiding even MORE than that in would-be-interest. And once all the debt is gone, we have already established really great financial habits which will help us reach goals like paying cash for a car a lot quicker than we ever thought we could. It won’t be as spectacular as months in the past, but we found some money we could throw at debt. We’ve been saving up to replace my car as needed. However, we decided that it should have enough life left in it to not need this fund up and running quite yet. Should something horrific happen, well, that’s what our emergency fund is for. So – we took it and put what we had so far at debt. The numbers are decent this month, so I’m looking forward to my end of the month post.